Want to a make mobile social network for you and your friends? Okay you don’t have plans to rival Facebook or even Foursquare, but you do want to make a group for you and your friends so you can communicate in a group through your phones without having to send mass texts. Described by some users as a private Twitter, Shoutem could be a very useful service for small groups who want to communicate better. Okay great but I’m not a developer. Well, you don’t need to be: networks can be created in just minutes according to Shoutem with no expertise required. And despite being an off-the-hook site, you can still control the access and look and feel of the site. Okay, it does help to have some understanding of html and general stuff though they offer email and video tutorial support. Haven’t tested this but seems okay. Well obviously there are lots of big social networks out there already, and I’ve got more accounts than I ever update, why should I use this little random one? What Shoutem say makes them different is exactly that they are “little and random” – they offer small-scale social networking. They cater to the niche, not the masses. Whether that niche is fans of Burnley football club or a group of friends who like to go fishing together, then they make it easier for people inside those groups to communicate with each other. So it’s all about the niche? Yes! A happy Shoutem user quoted on the Shoutem site is Sergio Lilavois founder of WE Harlem (USA) – founder : “Twitter is too big, with Shoutem we can keep it focused. So Sergio, Burnley Football club fans.. who’s going to use it? Little community sites I imagine: fan groups, friends, people with common interests or who live in the same area. The mobile location based thing is a big addition to Shoutem’s offering. 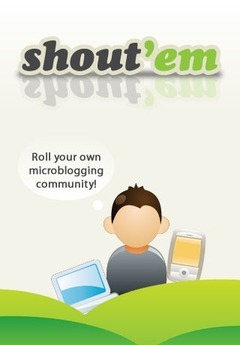 Shoutem started out as a microblogging site, but yesterday they launched a mobile app (for iPhone, Blackberry and shortly Android), and have repositioned themselves in the mobile social-network field, adding location based features to their existing products. So say you’re at a football game and want to know if any of your friends or network members are nearby, you can send out a message to all 10 or 20 of the people on your Shoutem network. You could put it on Twitter of course, but the chances are it will get lost among lots of other tweets and mass texts get expensive. As we say from time to time on this blog – mobile location-based stuff is The Hot New Area, because of the boom in GPS-enabled smartphones etc. It’s still in beta so not all the features work properly yet, and yes, if you want to make this great, it helps to have someone with an knowledge of CSS looking over the design.